As you all know from past posts, I have back issues. When your back is injured, you really are out of commission. My back injuries stem from several things...falling from a swing when I was a pre-teen and a car accident several years ago. 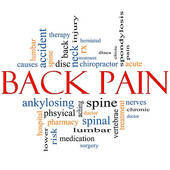 It is really amazing to me how debilitating back pain can be...especially for someone who has never suffered from it before. Because of the years I have had to deal with my health concerns I have learned how to make the best of the situations I find my self in and how to help alleviate my pain. I am going to share some of my tips with you all today in hopes it may help...some things you may already know and some may be new to you. Either way, I hope it helps! For years, I loved to wear high heels. I had a job as an administrative assistant which required me to dress up and there was a point in my life where "dressed up" meant nylons and high heels. Well, after wearing high heels for 4 years at my job, my back began to ache again. I kept reading about how you need to wear supportive shoes if you have back pain but I ignored what I read for the sake of fashion. Can I just say here that it isn't worth it? Wear shoes that have good soles in them and supportive arches. This may seem small, but it is important! I tend to do a lot of sitting...especially when I am on the computer. I am also a nursing mother and am constantly holding children. So, whenever I plop down (which is something you should NOT do...sit down gently to avoid jarring your spine) I try to remember to have good posture. Your feet should always be flat on the floor, or sometimes depending on the type of injury you have, have a small stool under your desk to put them on. Make sure your spine is straight and try not to slump over. This will also help you to feel more energized and less groggy. 3. Find a supportive mattress. I know, mattresses are EXPENSIVE. However, when your back hurts and you cannot sleep at night it probably is because your mattress is either worn out or not supportive enough. Several years ago my husband and I got a new mattress for our bed and when we were shopping for one, I don't know how many I laid on. Shopping for mattresses is so hard because you need to find one that meets your needs and not every mattress is right for everyone. So, having a good surface on which to sleep is KEY. If you can't sleep, you can't heal. Those are just a few thoughts I had on managing back pain. Most if not all of these are ones that I have used through the years to help my back feel better. Hope there was something here that was of use to you! This is a sponsored post for Healthy Back, however, all the points and views are my own.